Instant Pot Stick of Butter Rice is a variation of my Stick of Butter Rice recipe you bake in the oven. This recipe is so easy to make, and you can prepare this recipe in your Instant Pot or another style of a pressure cooker. Do you love Instant Pot rice recipes? I bet you do. You can make rice easily in your Instant Pot. It is actually my preferred way to make rice. It is so easy to cook rice in an Instant Pot. 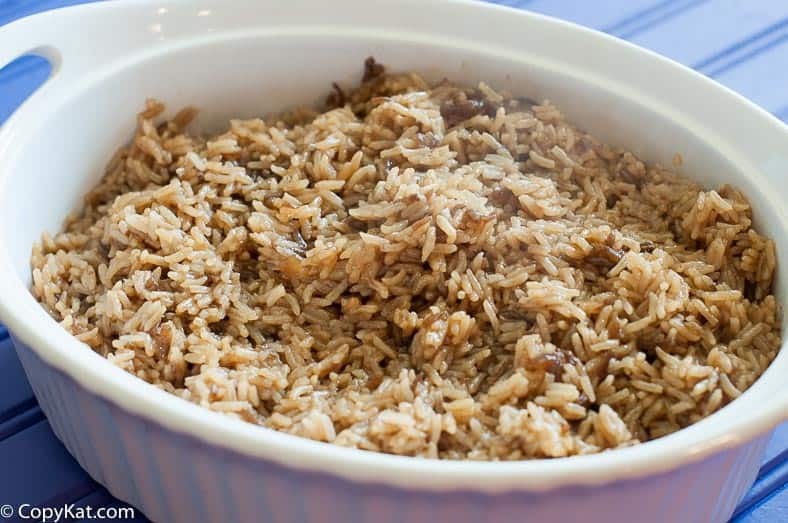 You simply add your water and rice, you use the rice setting on your Instant Pot, and in less than 30 minutes you have delicious rice. I think by pressure cooking rice you get rice that is perfectly cooked, and for me, this cooks quickly in a pressure cooker than with a rice cooker. If you have followed me for any length of time online you will know one of my dirty little secrets, I can’t cook rice on the stove top. I simply lack this talent. You may have the skill, I do not have it. For this recipe, I am using plain long grain rice. 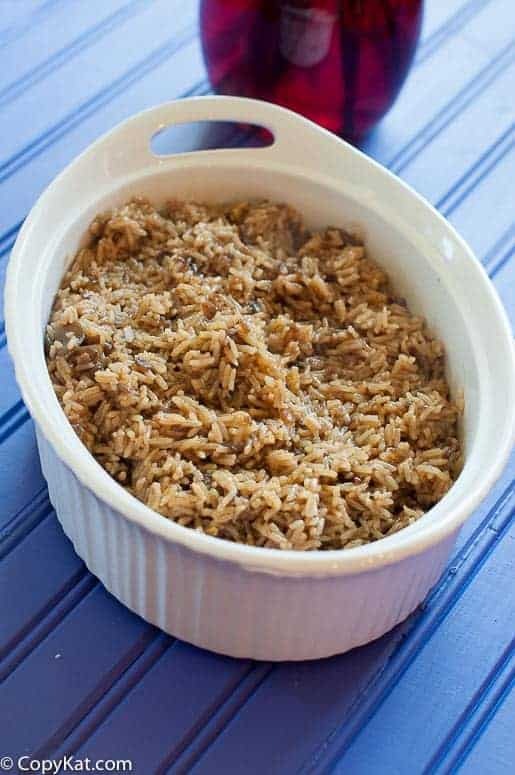 I haven’t tried making this recipe with brown rice, or even basmati rice, so this recipe is just for regular long grain rice. You will also need 2 cans of French Onion soup, 2 cans of beef consume, some Worchestshire sauce, and the stick of butter. You don’t need to add any water. This recipe does vary from the one that you bake in the oven, it uses less butter. It actually uses half of the butter, but it comes out just as flavorful. I know if you try this recipe you will soon fall in love with this recipe just I like to have. Want to learn more about cooking rice in a pressure cooker? Be sure to check out Hip Pressure Cooking website’s page. How to cook rice in a Pressure Cooker. Love Instant Pot Recipes? Check out these. Don't miss out on this delicious way to prepare rice. Place all ingredients in the Instant Pot pressure cooker. Place on rice setting. Do a natural release on the pot and enjoy. Do you have a different pressure cooker? According to http://www.hippressurecooking.com/easy-pressure-cooker-steamed-rice/ you set it for about 3 minutes for 2 cups of rice,. Then either high or low pressure, and then allow the pressure to do a natural release. Do you rinse your rice before adding to instant pot? I do not, but I know others do. Add 1/2 cup of slivered almonds to you recipe, sooo good! Thank you for that great idea. Do you happen to have a recipe for making “Rice a Roni”.. In an instant pot by chance? I’d love it! I do not have one at this time. I appreciate the suggestion. Do you use the rice cup that came with instant pot for measuring rice and a regular measuring cup for measuring other liquid? I know it makes a difference. No, when I created the recipe I used standard measuring cups. Is there any way to make it with whole foods—without the canned French Onion Soup and canned Beef Consume? I have plenty of homemade beef stock. Do you think I could cook it down and caramelize onions? You could do it with your own beef stock and French onion soup, I don’t think it will taste quite the same. For the recipe to work, just make sure your liquid/rice ratio is as written in the recipe. As there are only two of us in this household lots of rice at one time is not required. I usually make the amount specified and freeze the rest.. It thaws beautifully with the grains all separate. Just a quick nuke in the microwave and we are set to go. I love my Instant pot. Does this recipe for the Instant Pot use 1 stick of butter or 1/2 stick of butter. I’m a little confused because it says it uses less than the oven method. The oven method shows 1 Stick of butter and so does this recipe. I just want to make sure I have it right before I try it, Looks delicious. Thank you! Use 1 stick of butter for the instant pot. The oven method uses half the amount of rice, but it still uses 1 stick of butter. That makes sense! That you for taking the time to explain! Can’t wait to make this! Would this work if cut recipe cut in half? It would work ok, but I am not sure how you would divide it up. Couldn’t you just cut everything in half? I can’t wait to get a pressure cooker and try this. I’m like you; can’t cook regular rice on the stove to save my life. I just buy instant rice, or those pouches of microwave rice. They both work fine, but cost a lot more in the long run. Do you dilute the french onion soup and beef consume first? Sounds like way too much liquid. I am novice to the Instant Pot…when setting it on the rice button,do you have to set a time? You do not need to set a time when pressing the rice button. It will take care of that for you. Yes, here was my oven version. Scared? Good grief, do you think it is going to bite your nose? Looks like a great rice recipe except we can not have all that sodium. Do you have any quick recipes with low sodium? i haven’t worked on any yet. How do you make this in another brand of electric pressure cooker that doesn’t have presets? According to http://www.hippressurecooking.com/easy-pressure-cooker-steamed-rice/ you set it for about 3 minutes for 1 1/2 cups of rice, I am going to say 5 minutes for the 2 cups of rice here. Then either high or low pressure, and then allow the pressure to do a natural release.